.com is still the king of suffixes. 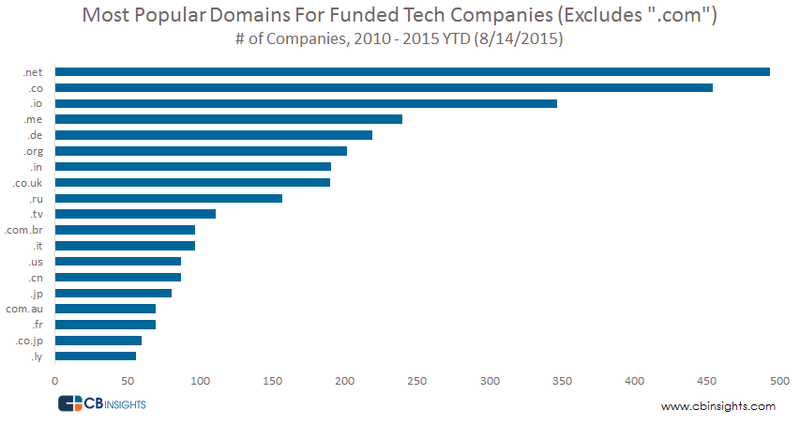 But startups are also flocking to other domains, including .io. In a recent essay, Paul Graham recommended that startups should own their .com domain name or risk being considered marginal or weak. However, .com domains can be very expensive, especially for younger startups. We used the CB Insights database to analyze the trends in startup domain suffixes over time, such as the rise of the .io suffix. Traditional .com domains still dominate amongst the more than 25,000 tech companies funded since 2010, with 20,000+ companies choosing a .com domain for a 81% share of all suffixes. But other domain suffixes are also popular. These include .net and .co domains, which proved to be the most popular, followed by .io which saw nearly 350 funded tech companies choosing that domain. After the top 3, the list is populated mostly by more geography-specific domains such as .de (Germany), .cn (China), and .jp (Japan). Also, .tv has been used by more than 100 companies, including well-known services Twitch.tv, blip.tv, and acfun.tv. The .ly domain, often considered a go-to suffix for Silicon Valley startups, isn’t really all that popular. 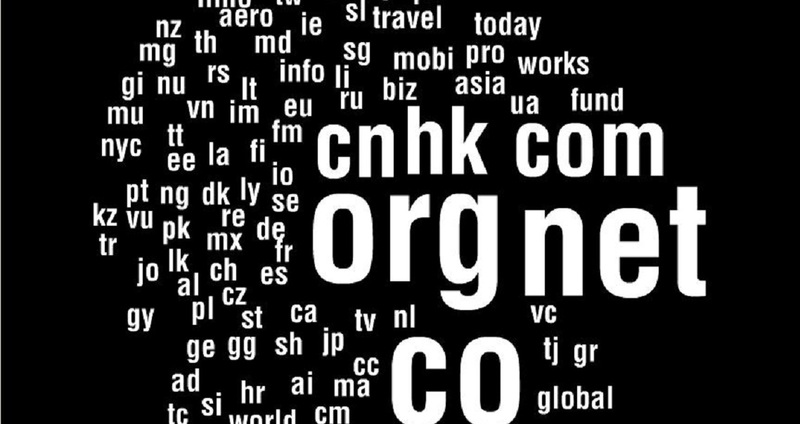 With a flurry of new domains having been made available by ICANN recently starting in 2014, startups will increasingly seize the opportunity and flock to alternative domain suffixes. But many of the newest suffixes like .global are not showing up on the radar just yet. Among the top URLs, some have seen more growth than others in recent years. 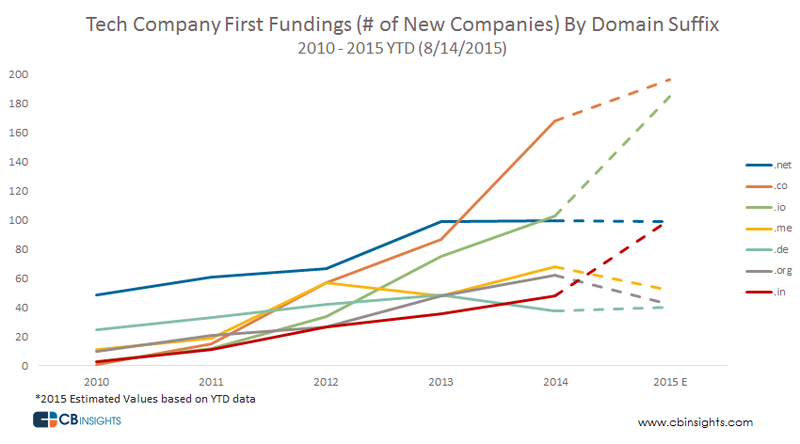 The .co domain saw the largest spike, with a 93% jump in the number of new companies being funded with that domain suffix between 2013 and 2014. Both .io and .in have seen steady growth, and have already reached all time highs in 2015 in terms of registrations for funded companies. .net domains, while having the most funded tech companies in total since 2010 (after .com), has slowed significantly in growth, with only 61 companies being funded with that domain name through mid-August 2015. The number of unique domain suffixes attached to startups in a given year saw a significant jump between 2011 and 2012. There were 116 separate domain suffixes used by startups this year through mid-August 2015, almost double the amount in full-year 2010. It’s not uncommon to see new domain suffixes pop up when looking at startups receiving funding (i.e., suffixes that have never been attached to a tech startup before). Below are select new domain suffixes that have been funded recently as well as the companies attached to them. In 2015, we saw new startups with .soy and .world suffixes. Some are country-level geographic suffixes, e.g. .dj is Djibouti.